HP S600 2.5" 240GB SATA SSD Review - Legit ReviewsHP SSD S600 - A Good DRAM-less SATA Budget Drive? HP SSD S600 – A Good DRAM-less SATA Budget Drive? Upgrading from a hard drive to an Solid-State Drive (SSD) is one of the best ways to boost performance in an aging notebook or desktop PC. At one point in time upgrading to an SSD was a costly venture, but prices have drastically fallen in recent years and can now be done affordably. SATA III SSDs were once the darling of storage industry, but with the advent of PCIe NVMe drives they aren’t being talked about much. PCIe NVMe drives are getting all the headlines these days as they offer the best performance and cable free installation, but SATA III drives are far from being done. SATA drives are great for mainstream users and are often much cheaper as they are becoming a commodity. Moving to an SSD will make your PC more responsive and the faster speeds will improve your productivity. Today we’ll be looking at the HP SSD S600 2.5″ SATA III drive series. 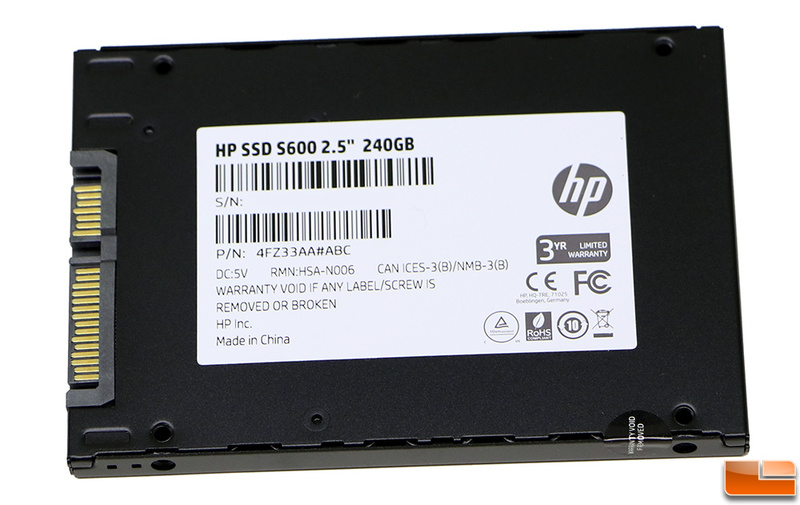 HP has been really making a name for themselves in the SSD market over the past year and the HP S600 was recently launched to cover the entry-level SATA SSD market. 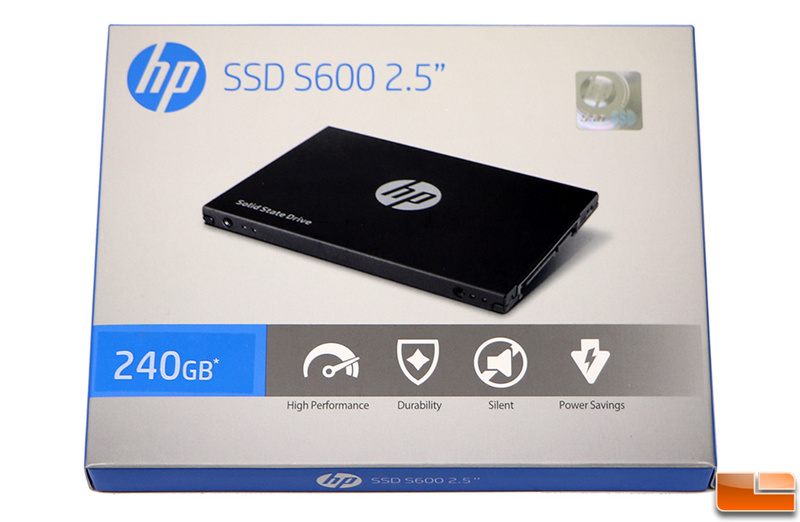 The HP SSD S600 is available in just two capacities – 120GB for $35.99 shipped and 240GB for $59.99 shipped. These are rather small capacities in this day and age, but they are super affordable at $0.30 per GB on the 120GB drive and $0.25 per GB on the 240GB drive. Under the hood you’ll find the Marvell 88NV1120 dual-core, dual-channel DRAM-less controller that has been paired with Micron’s 64-layer TLC 3D NAND Flash Memory. That pairing is good for sequential speeds of up to 520 MB/s read and 500 MB/s write on both capacities. The 4K Random performance is 24,000 IOPs Read and 59,000 IOPS write on the 240GB drive. The smaller 120GB drive has 1,000 IOPS lower Random 4K performance, but you’ll never be able to ‘feel’ that during normal system use on a consumer PC. DRAM-less SSDs have been on the market for a number of years and generally have a negative connotation as they typically perform slower than SSDs that have DRAM cache. This is true in general, but they are still faster than most all hard drives and are used in the value-SSD market to bring you the lowest prices possible. The Marvell 88NV1120 controller is aimed at value-line products, so this drive at its core was built to be a budget drive. For those wanting more performance be sure to look at the HP SSD S700 PRO series that has a silicon motion SM2258 4-channel controller and DRAM cache. Other specifications worth talking about would most certainly be the endurance rating and warranty length. 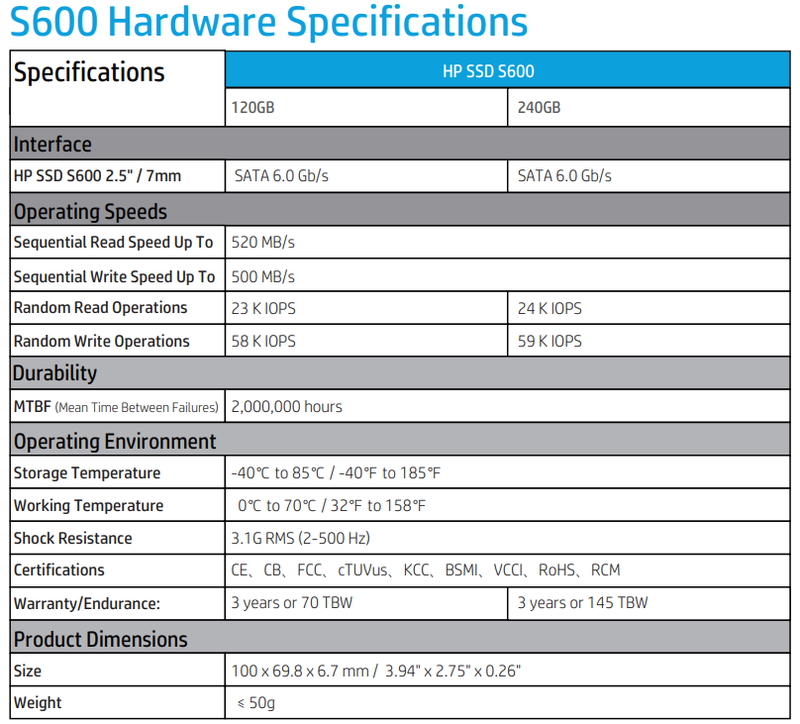 HP backs both S600 SSD models with a 3-year warranty or until you exceed the TeraBytes Written (TBW) rating. The TBW rating shows is basically how many terabytes of data that you can write to the SSD before its life expectancy is iffy. When you do the math on this it comes out to being about 0.53 Drive Writes Per Day (DWPD) on both drives. That is very respectable for a low-cost 3D TLC NAND Flash drive as you can nearly fill more than half this drive with data every day and not have to worry about going over the endurance rating. Lastly, if power is a concern… Idle power is 0.38 Watts for both drives and the typical active power draw is 1.4 Watts on the 240GB drive and 1.05 Watts on the 120GB drive. The model that we’ll be testing today is the S600 240GB, which is sold under part number 4FZ33AA#ABC in North America, 4FZ33AA#ABB in Europe and 4FZ33AA#UUF in Asia. The price for this drive right now is $59.99 shipped on Amazon in the United States. HP stuck with the same minimalist case design that they’ve had for some time now on the S600 series. The black aluminum case has a nice matte finish and the white labeling is easy to see. Inside the retail packaging you’ll find four screws to properly mount the drive and the quick start guide/warranty statement booklet. 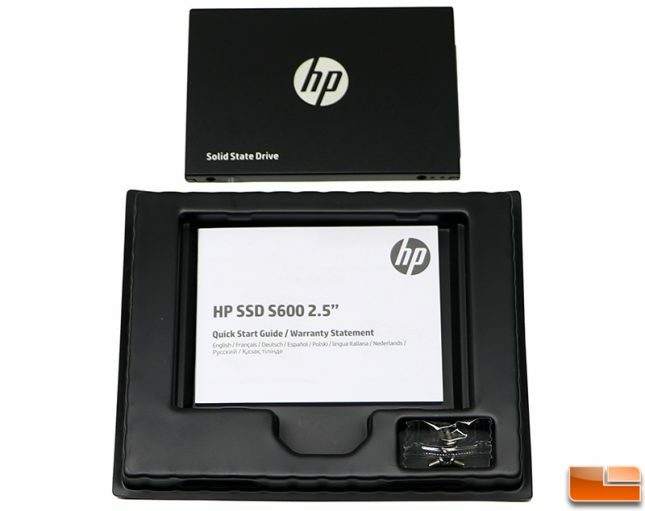 When you flip the HP SSD S600 drive over you’ll find the product label that shows the model name, part number, serial number, warranty length and much more.